Ain't nothing like a New York bagel. Ah, the bagel – one of the most beloved, longstanding breakfast foods of all time. The bready concoction can be extra hard to make, so read carefully. Start with a combination of flour, yeast, water and oil to create your eggless dough. Twist the dough into a hand-sized ring and drop it in boiling water. Interestingly enough, bagels are the only bread product that gets boiled before you bake it. 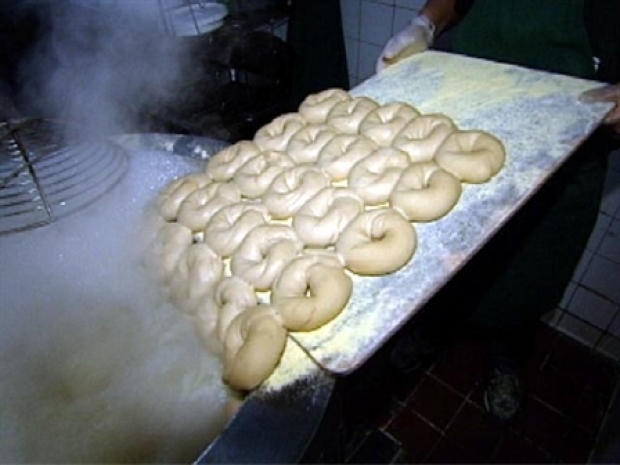 Boil the bagel-to-be for 3-5 minutes on each side, drain the water, brush it with egg if you like, and bake it in the oven for about 10 minutes. Bake poppy or sesame seeds on the outer crust if you're so inclined. Voila -- a thick, chewy, doughy bagel in the middle with a crispy shiny outer crust. Note: The New York bagel is decidedly different from the ones they make in Montreal, so don't go all Canadian on us, eh? Salt and malt go into the New York-style bagel. That recipe gives you a puffy bagel that's moist on the outside the way New Yorkers like it. The Montreal-style bagel isn't as big as the New York one; it's sweeter, crunchier and has a bigger hole. Why do bagels have holes anyway? As the Golden Local debate for the city's best bagel heats up, we answer the all-important question. The hole allows for a more even cooking and baking of the dough. Bakers might use the hole to thread string through groups of bagels to fill out their display cases. It also makes bagels easier to transport. Ultimately, you've got to have the hole whether you're a baker or not. Otherwise you're just slaving over a hunk of bread.